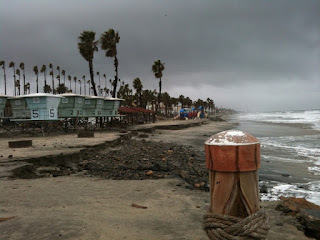 Rita Spiegel Photography: The surf is taking over! Southern California needs the rain, but does it need to come in one week? Oh well ... if you can't beat the storm, run and dance in the rain. That's about what I've been doing. Since Monday (1/18) we've had four storms in a row and people (and dogs) are getting "cabin" fever. I'm used to walking 45 minutes each day ... but I've barely gotten out. Each time the sky clears, I rush my Kharma outside for a walk, since he's off his doggy schedule. This morning the rain stopped and I was able to get out for 2 hours ... Kharma and I walked for walked at the park and then went to the beach. 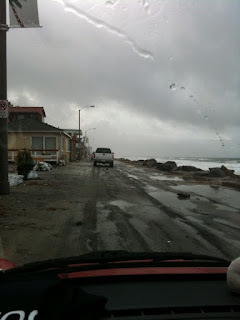 It was incredible how much the storm affected the beach. 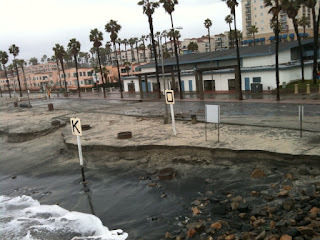 We were by Oceanside Pier and much of the sand has torn away from the beach. Several fire pits were taken by the surf. As you can see, more than 1/2 of the beach was taken. There will be a lot of cleanup after this storm. It was windy and went it started to rain again, we headed back to the car. Once in the car, I drove the strand and it was also taken over by nature. Very flooded and the same from the beach is also on the road too! Now, we're back inside for a while. I'm working on my photos, job hunting and my website. I'm hoping the rain will stay away for a few hours ... to give me time to give Kharma a walk (after dinner).